Steven (Chicagoland, United States) on 22 February 2008 in Architecture and Portfolio. On Monday, October 11, 1897, the Chicago Public Library System's Central Library opened its doors to the public and a 24-year dream of a permanent home for the library became a reality. The building, located at 78 East Washington Street, is bounded on the east by Michigan Avenue and on the north by Randolph Street. The building is a harmonious combination of Italian Renaissance, Greek and Neo-Greco architecture that had become popular in Chicago following the World's Columbian Exposition of 1893. The interior of the building is majestic with mosaics, marble stairways and a Tiffany dome. In designing the building, 25 draftsmen took one year to complete nearly 1,200 drawings. After nearly 70 years of continuous service with only minimal maintenance repairs, the Chicago Public Library's Central Library building was showing signs of age: space was inadequate for the large book collection and the ancient coal-fired generator plant and heating systems were inefficient and a source of continual problems. The library's Board of Directors authorized a massive renovation of the aging building, a process which took three years and $11,000,000 to complete. 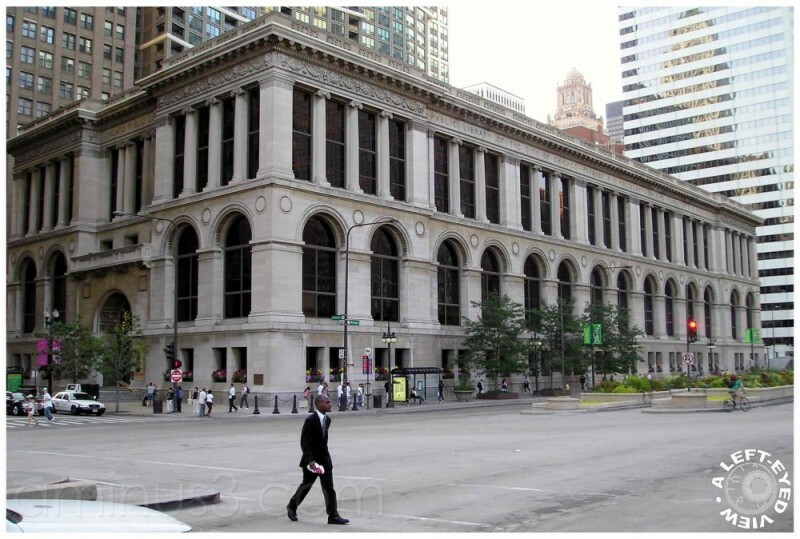 The architectural firm of Holabird & Root developed the renovation plan and the library reopened on October 11, 1977, with a new name: The Chicago Public Library Cultural Center. The "central" library is now the Harold Washington Library. I totally forgot about today's Photo Friday so this picture hardly qualifies, depending on how you interpret the word. You have captured excellent detail and a fine street scene as well. Interesting juxtapositions and reflections to reveal 3 very different buildings - nice one! A grand old building, too bad the surrounding architecture does not respect it. Great capture of a fine building! Looks like a temple of knowledge!